When I started teaching, I had some reservations about being completely in charge and responsible for the rules, so I tried involving the students in this task. Part of my intention was an honest stab at building a positive, win-win classroom environment, wanting to acknowledge the students’ needs for input and control. I also believed, or at least hoped, that their input would magically inspire self-management. I was wrong. This exercise killed the entire morning and produced about 478 “don’ts,” nearly a quarter of which had to do with a range of objects the students felt they should not throw in the classroom. I quickly realized that the brunt of enforcement would ultimately rest on my shoulders, and with nearly 500 rules, their list would have certainly kept me hopping, putting me more in the role of policing these children than teaching them. This was my first inkling that there were some serious problems with rules, at least as we know them best. I found this revelation extremely disconcerting: It was obvious that no class could succeed without some kind of structure and authority, but were rules the best tool for establishing them? Rules certainly were familiar! But there were simply too many places where the methods and dynamics of rule-making and enforcing just didn’t fit in with my idea of win-win. What else was there? Was there a way for teachers to truly get what they wanted from their students without creating additional conflicts, resorting to traditional authoritarian power dynamics, or somehow compromising the emotional climate of the classroom? I started looking for techniques that worked, strategies that were not only effective in classroom and behavior management, but also in creating the kind of climate that would support the goals and values of a win-win classroom. I had noticed that certain “if . . . then” statements were more positive, more effective and less power-oriented than rules. I discovered that the promise of positive outcomes was less destructive than the threat of negative consequences. And I found that the most successful teachers were those able to ask for what they wanted with clarity, assertiveness, and great respect for the needs, preferences, and dignity of their students. Additionally, research and experience in fields that included business management, child development, counseling, and addiction (family systems as well as chemical dependency) gave me a few more critical ingredients to throw in this stew. The result involved reframing rules as boundaries and suddenly the whole process fell into place. Now I’m hardly the first person to write about boundary setting (although not all definitions include the characteristics I believe to be essential) and quite frankly, the idea is, in many ways, not all that different from more common terms like limits, contingencies or, in some ways, rules. But the interaction patterns involved in this technique are quite different from those used with rules, and they’re still pretty uncommon in most educational settings. Regardless of format or conveyance, these lists were invariably negative. Often the rule itself was stated negatively: “No hitting,” “Don’t call out,” “Eating in class is prohibited.” However, even when the rule was stated positively (“Turn in work on time,” “Speak respectfully,” “Raise your hand to speak”), the result of an infraction was always negative. In some instances, the punishments— often called “consequences”—were listed right along with the rules. Frequently, to my amusement, the list included consequences for the first infraction, the fifth infraction, the thirtieth infraction . . . There are subtle differences, in process and focus, between encouraging cooperative behavior and discouraging uncooperative behavior. Rules and penalties depend on the students’ fear of the negative consequences. If the child is afraid of a bad grade, missing recess, or having her name written on the board (which, incidentally, simply reinforces attention-getting behavior for most kids) then she may do what you want, often at a cost to her emotional safety and to the general stress level in the class. But how many kids aren’t fazed by even the most severe negative consequences? (Indifference is a great tool for creating safety in an otherwise unsafe environment.) Either way, if you’re committed to win-win priorities, when you rely on rules and punishments, you negatively impact the climate of the classroom, and you very often lose. In addition to being positive, boundaries support win-win power dynamics because they are themselves win-win. Even the most reasonable rules are oriented to the power needs of the adult, providing information for the students how not to “lose.” Rarely do rules communicate how students can “win” in any other, more positive way. Boundaries, on the other hand, take into consideration to the desires and needs of the students they attempt to motivate. The subtlety of the differences between boundaries and rules makes it easy to discount the impact each can have on the emotional climate in a classroom and the quality of the relationship between teachers and students. 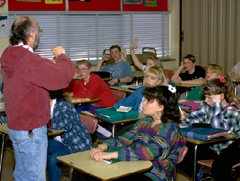 However, teachers who endeavored to shift from the win-lose familiarity of rules to the win-win prospects of boundaries report a significant decrease in conflicts and power struggles in their classes, and far greater success in reaching kids previously deemed difficult, unmotivated or, in some instances, even dangerous, than with any strategy previously attempted. The original version of this article appeared in 21st Century Discipline, by Dr. Jane Bluestein This updated version of this information was adapted from The Win-Win Classroom © 2008, Corwin Publishing, Thousand Oaks, CA. Please support this site. Click here for more information.